Welcome to my Nady SCM-1000 condenser microphone modification project page. I bought this slightly beat-up, inexpensive large diaphragm microphone so I could experiment with the figure of 8 pattern. I changed some components and cleaned it up, but the biggest change I made was to remove the stock microphone capsule and replace it with a higher quality capsule. I took lots of photos while I worked on this microphone. Click on any of the images to view them in higher resolution. I have never owned a large diaphragm (LD) switch selectable, multi-pattern condenser microphone. Almost all of the recording I do is with small diaphragm (SD) microphones as they are generally more useful for the type of recording I do. I thought it was about time I bought and started experimenting with a multi-pattern LD microphone. I bought a used Nady SCM-1000 LD microphone on eBay. 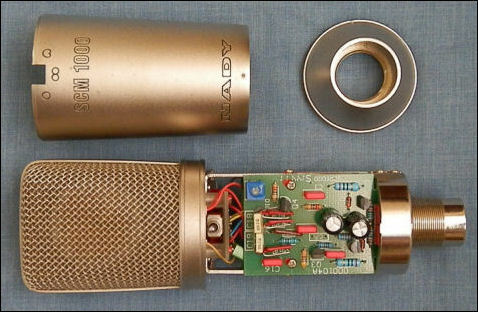 This mic has a front mounted switch (pictured on the right) that allows the user to select between three different polar patterns, omni-directional, figure of 8 and cardioid. It's the figure of eight pattern that really sparked my interest in buying this specific microphone. Since it's rare and expensive to implement a proper figure of 8 pattern for small diaphragm pencil mics I haven't owned a figure of 8 pattern microphone. So, buying the cheap Nady SCM-1000 was a good opportunity for me to acquire an LD mic and make a project out of upgrading it. When I received the mic and opened it up I wasn't surprised to see the capsule area was very dirty inside. See the photo below left. The eBay merchant clearly described the microphone as "for parts use only" and I did pay less than $50 for it. The real surprise was how nice and clean the circuit boards and wiring were and the fact that the mic even worked at all. I knew I'd have to remove the old capsule and install a new one anyway, so the dust and dirt didn't worried me much. That can be cleaned up easily. 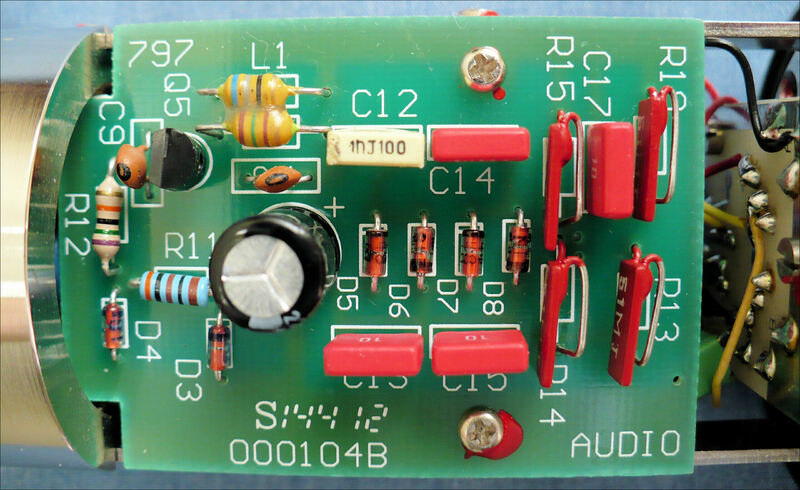 The pre-amp circuit design is similar to the circuit used in the CAD GXL-1200 microphone I modified in 2011. The major differences being that the CAD microphone uses a single small diaphragm while the Nady SCM-1000 uses two 27mm diaphragms. This dual diaphragm, pattern switching microphone incorporates a toggle switch and extra components to implement the changing of the polar patterns, including figure of 8, that aren't practical or are overly expensive to implement with a SD mic. When looking at the internal circuit boards I was impressed to see the use of some high quality through-hole components such as WIMA film capacitors, Teflon stand-offs for the FET and coupling capacitors and 1% metal film resistors visible on the photo below, right. Previous online research informed me that few engineers and recordists believe this Chinese manufactured microphone is acceptable sounding in it's off the shelf form. The main criticism being that it's just way too bright. The reason for the excessive brightness, I learned, is the cheap K67 style capsule that is installed is not the best choice to use with the flat response circuit utilized in the pre-amp circuit of the microphone. 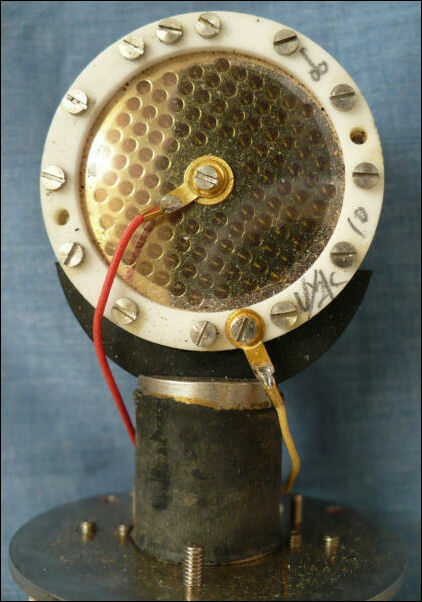 The K67 style capsules are meant to be implemented with a de-emphasis circuit built into the microphone to counteract the K67 capsule's inherent brightness properly. I spent a good amount of time listening to the stock microphone, which surprisingly, actually worked despite how dirty the capsule looked. I made some live music recordings using the omni-directional and cardioid patterns, comparing the sound of the new mic with some of the other condenser microphones I own. Probably because the capsule was so dirty it sounded rather dull and quite noisy compared to my reference microphones. There are a few things I learned while researching this microphone online that I thought I'd implement since I was going to install a new capsule into it anyway. The circuit on the back side of the stock microphone brings the microphone working voltage up to 77v DC. This voltage, when halved, for the various polar patterns is not ideal. Many LD microphone capsules work best when operated between 50v & 60v DC. Happily, I learned it's easy to raise the voltage that is sent to the capsule. I just had to change the value of the 6.8v zener diode used for DC voltage regulation to 9.1v and change some of the film capacitors in the circuit to 250v so they can handle the increased voltage. Doing this brought the working voltage to 105v DC, which is nearly perfect according to what I have read. I had some really nice 100K .05% foil resistors I used to replace two 1% 150K film resistors in the input stage of the mic. I also added two larger DC blocking capacitors to the front of the circuit which allows the microphone to capture lower bass frequencies. The last circuit modification I made was to change the high-pass corner frequency of the bass roll-off switch. The stock mic had a switch activated roll-off corner set at around 100Hz. That frequency is a bit too high for my needs. Typically that type of roll-off is used when close micing instruments or voices with the mic in the cardioid pattern, which is not my intended use. With the generous advice of microphone and circuit designer Jon O'Neil at Naiant, I learned I could lower the high pass corner frequency and slope to by changing just two resistor values in the stock circuit. After removing the tattered inside layer of mesh screening in the basket of the mic and thoroughly cleaning everything inside, I connected it to a pre-amp and did some more listening. Cleaning up the circuit boards and capsule area along with the minor component changes I made raised the sensitivity slightly and the mic sounded more open and brighter but still not great. With the now lower corner frequency of the roll-off switch I could hear that it was moved, but I'm going to have to make some pink noise recordings to see where the roll-off actually starts now. My guess is it will be just about right. I decided to use the same Rust-Oleum Oil-Rubbed Bronze metallic spray paint I used for the CAD GXL1200 microphones I modified in 2011 to paint the body cylinder on this microphone. Before painting, I filled in the machined in Nady SCM-1000 branding with body filler and sanded the whole thing down with 220 grit sandpaper. I applied a coat of good metal primer next, because paint doesn't stick well to the electroless nickel plating used on the body of the SCM-1000. After applying two coats of spray paint and letting that dry for two days, I rubbed some metallic silver acrylic paint into the switch markings that are machined onto the body cylinder to give it a nice finished look (left). Next up, making the biggest change. Replacing the stock capsule with a brand new, higher quality capsule. I had three things in mind when I looked for the new capsule. Cost efficiency was number one. I didn't want to put a lot of money into this mic as I was mainly wanting to experiment with it. It also had to have two well matched diaphragms (to operate properly in the figure of 8 pattern) and it had to have that slight rise in the high frequencies for the diffuse field recording I typically do. After e-mailing with several capsule suppliers and reading on various microphone discussion forums, my research brought me to http://microphone-parts.com which is an online microphone modifying parts business operated by Matt McGlynn. The site has complete kits that include detailed instructions and all the various components needed, already gathered together for doing modifications to LD mics. He also sells individual or matched pairs of LD capsules as part of kits or separately. McGlynn also maintains the excellent microphone database resource http://recordinghacks.com. The site is well worth a look if you are interested in microphones. There is a lot of very good microphone information gathered together in one place there. The http://microphone-parts.com web site has good prices and the capsules are highly regarded by the people who modify and rebuild microphones. I choose the $109 RK-12 which is a dual diaphragm edge terminated capsule (right) that is modeled after the AKG C-12. My appreciation for the crisp AKG sound is what led me to choose that specific capsule. McGlynn even sent me an individual frequency response graph that was generated from testing the capsule after it was manufactured. I thought the new capsule installation was the easiest part of the project. I wanted to do this last, because I wanted to minimize the possibility that the new capsule would be damaged while doing the other work on the microphone. Removing the old capsule was a breeze. I followed the excellent step by step instructions on the microphone-parts.com capsule installation page. The new capsule and saddle fit perfectly on the post that was already on the stock microphone. I soldered the three wires from the new capsule to the same three points the old capsule wires were connected to on the circuit boards, and my LD mic mod project was almost done. Finally, I reassembled the mic and did a rudimentary voice test, to make sure the microphone worked properly. Immediately I knew I attached the new capsule wires to the proper places when I switched it into cardioid pattern and the sound of my voice was much louder from the front of the mic than the back. I also could tell the figure of eight pattern was working properly, because I heard the expected null when I spoke into the side of the head basket. It sounded good, but I'll have to record music with it to get a better idea of it's true sound. I'll write an update when I get the chance to use this microphone in the field to make a recording. I recorded a Colorado band, The Magic Beans on December 6, 2013 at the Ogden Theatre in Denver. I used the modified SCM-1000 in figure of 8 pattern as the side mic with an AKG C-483 facing forward as the mid mic for my first mid/side recording. I'm happy with the way the microphone sounds. It's a bit thinner sounding than I expected, but I have been told the bass frequencies suffer when using the figure of 8 pattern. The recording is nice and clear sounding though. The SCM-1000 mic and shock mount plus the mid mic and it's shock mount take up a lot of space in my gear bag, so I'm not sure how often I will use it in the field. Also, in the figure of 8 pattern the mic picked up a lot of chatter from the audience, since it was not picking up the direct sound from the speakers and the stage. So, I'll want to try using it much closer to the stage in the future. I have included a link to the mid/side recording I made below. © time between the notes... 2012-2019 All rights reserved.